I have always loved breakfast sandwiches- specifically egg sandwiches. Now that I live out west, breakfast burritos are much more prevalent, but every once in a while, I need to get back to my roots. The sandwich pictured above was actually Dev's. He only likes his eggs scrambled. 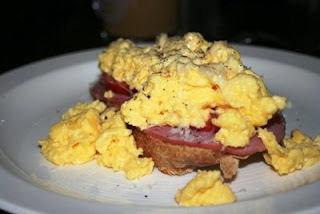 My version of this sandwich had a fried egg and some hollandaise sauce on top (and, of course, the Canadian bacon). I guess you could call it a short cut Eggs Benedict sort of thing. I highly recommend this as a lazy weekend meal, or wrapped in some parchment paper or foil as a meal on the go. And as far as possible toppings, the sky's the limit. Throw some hashbrowns on, or maybe even some strips of roasted green chile. If I'd had a lovely red tomato, you can bet that would have been on there, too. What's not to love about breakfast? ?